Nikumaroro Island seems to be the most likely place to find Earhart’s Lockheed Electra if it will indeed ever be found. Home » Aviation Articles » History of General Aviation » Will New Expeditions Solve The Amelia Earhart Disappearance? Is Nikumaroro Island the Location of the Amelia Earhart Disappearance? Of all the mysteries and conspiracy theories making up a good portion of American history – the JFK assassination, 9/11, the moon landings, Roswell, etc – none has such a resurgence as that of missing aviator Amelia Earhart, and the cause of her disappearance. The pattern has stayed the same for decades. Years will go by without a mention of her name, then someone will announce a breakthrough in evidence regarding the Amelia Earhart disappearance and suddenly she’s back in the headlines. When it was reported in 2014 that a scrap of aluminum found on Nikumaroro Island was likely from her plane, Google searches for “Amelia Earhart” skyrocketed. Nikumaroro Island seems to be the most likely place to find Earhart’s Lockheed Electra if it will indeed ever be found. The International Group for Historic Aircraft Recovery (TIGHAR) has been focusing on this island for decades, and during their next planned visit, they hope to be using the most sophisticated submersibles they’ve used to date. Bones of a castaway were found in 1940. The skeleton was only partial; one analyst concluded that the skeleton belonged to a female of Earhart’s height and ethnicity. Another analyst determined that the bones belonged to a large male. 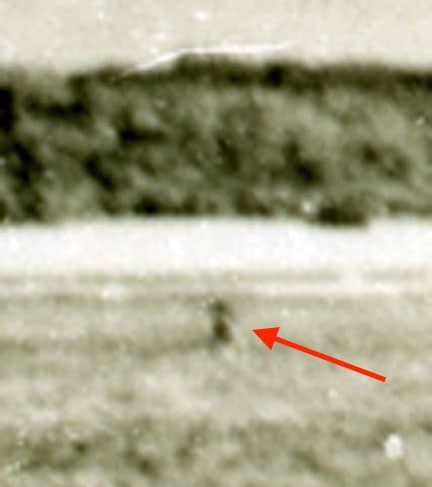 A 2010 analysis of the “Bevington photo,” taken in Nikumaroro in October 1937, found an object sticking out of the water above the reef. The object was the approximate size and shape of the Electra’s landing gear. An aluminum fragment was found washed ashore in 1991. TIGHAR announced in 2014 that they are almost certain this piece of aluminum is a patch Earhart made to her plane in Miami when she covered a window. Some analysts say (inconclusively) that this aluminum couldn’t have originated any earlier than WWII while others have, also inconclusively, matched it to photos taken of Earhart’s plane. Navy fliers searching the area after her disappearance noted that the island showed recent signs of habitation, though they did not see signs of the aircraft. The island was otherwise uninhabited from the late 19th century until December 1938. 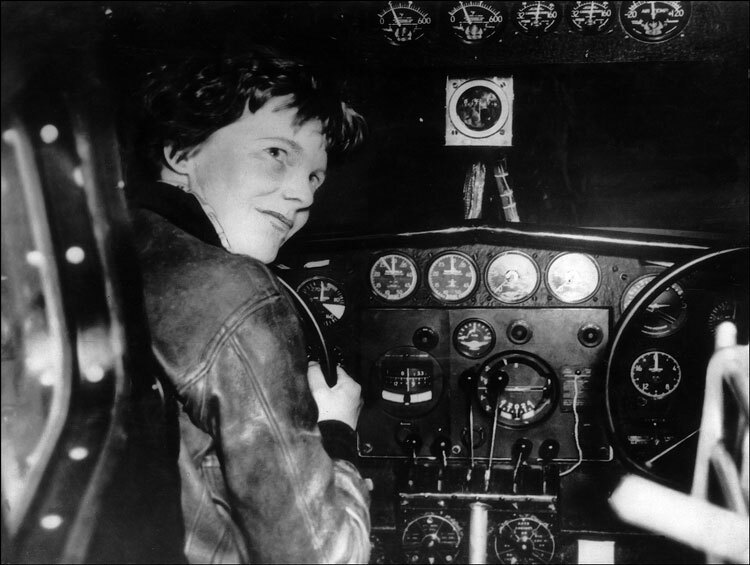 Earhart’s final frantic radio calls to the Coast Guard cutter Itasca indicated that she was flying on a line of 157/337 degrees at an altitude of 1,000 feet with only 30 minutes of fuel remaining. Nikumaroro Island lies on an approximate bearing of 157 degrees from her intended destination of Howland Island. Other artifacts found on the island seem to have belonged to a female from the mid-1930s. But the island did have a small British colony starting in December 1938. With the preponderance of evidence shown here, TIGHAR’s theory is that Earhart crash-landed on the island’s reef and became a castaway until succumbing to nature. 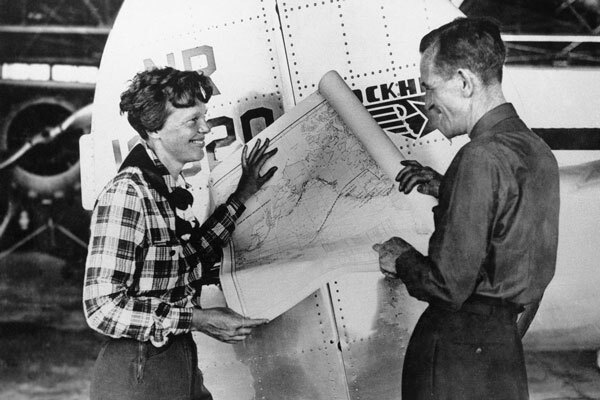 Cloud cover had prevented her navigator, Fred Noonan, from taking celestial sights and Earhart admittedly wasn’t proficient enough in radio navigation to take off on a round-the-world flight. They turned to search for Howland Island, and as the engines started to flame out, spotted Nikumaroro (then Gardner Island) and put it down on the reef. Earhart continued to make distress calls for a few days after landing, running the engines for battery power when the tide was low enough. Before the Navy arrived to search, a storm had carried the wreck off the reef and down the undersea slope. TIGHAR made their tenth expedition out to Nikumaroro in July 2012 with the intent of mapping the seafloor with sonar. They specifically wanted to focus on the area around the reef where the Bevington photo showed a possible aircraft wreckage. The sonar returns did indicate a debris field at a depth of 200 feet near where the photo was taken. The sonar data was still being studied in April 2013, when another large anomaly was found at a depth of 600 feet in the same line as the debris field and photo artifact. This anomaly was approximately 22 feet long and could very well have been a piece of the fuselage. Another expedition was conducted in 2015. The specific goals of this eleventh expedition were to study this sonar anomaly and also search for possible campsites. This expedition did not go so well. Divers searched the reef down to a depth of approximately 130 feet. They found a few fragments of metal, but none that could be identified as belonging to an aircraft. A mini-submersible was sent down to 200 feet to investigate the debris field that the sonar found, but the tether on the submersible snagged on something and the whole thing imploded. Shoreside expeditions failed to find any new evidence of campsites; with the amount of storms that this island sees it’s likely that nothing will ever be found now. But the biggest setback came from the remotely-operated vehicle that was to investigate the sonar anomaly at 600 feet. This ROV suffered a series of small failures, all totaling up to an eventual failure of the motherboard. TIGHAR had carried backup ROVs on previous expeditions and the backups were never needed. On this expedition, budget constraints prohibited them carrying a backup that was now needed. They were never able to investigate this deeper clue. After this failed expedition, the raw sonar data was analyzed again. Much to the disappointment of everyone, this “anomaly” turned out to most likely be a geologic feature like a coral ridge. This still has not swayed anyone from continuing their search. TIGHAR planned a return in 2017 but in March 2016 announced that they may be going even sooner. All they’re waiting on is a sponsor to cover the million-dollar bill for operation of the most advanced submersibles they’ve used yet. Who wants to write a check? The Hawai’i Undersea Research Lab (HURL) is planning a three-month marine biology survey of the Phoenix Islands, which Nikumaroro belongs to. HURL operates two manned Pisces submersibles. These subs, with a crew of three, can reach depths of 6,000 feet and have participated in finding many WWII-era wrecks. As soon as TIGHAR can secure funding, they and HURL will go ahead with their survey. TIGHAR isn’t the only organization actively trying to solve the Amelia Earhart disappearance. The Northern Ireland based Stratus Project continues to search in the deep waters near Howland Island. Stratus is using unmanned submersibles to explore the waters with sophisticated sonar down to 18,000 feet. But all they’re going on is Earhart’s planned route of flight. Stratus has yet to come up with any kind of findings. So what really happened to Earhart? Will the ocean ever give up its secrets? The sea is the only one that knows the answers to countless mysteries from the past few thousand years. It’s likely that the Amelia Earhart disappearance will remain in this group of unsolved mysteries. “Lost at sea” is too easy an explanation for people to believe. There has to be more to it than that. This is why people want to believe that she was spying for the U.S. but was captured and executed by the Japanese. Or that she staged her disappearance so that she could escape the spotlight and live her life as a New Jersey housewife. For now, Nikumaroro will stay at the center of the Amelia Earhart disappearance and hopeful recovery. Stay tuned for TIGHAR’s next adventure to the Pacific!